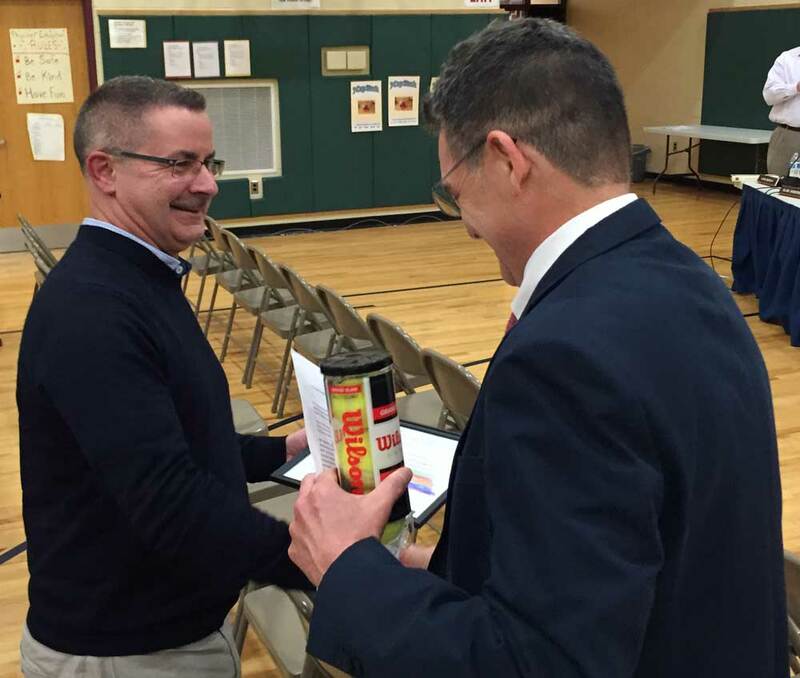 Pocopson Elementary School Principal Clif Beaver offers congratulations to retiring teacher Dennis Nelms during Monday night’s Board of Education meeting. POCOPSON — It appears that the final tax increase for the Unionville-Chadds Ford School District will drop some from its initial estimate, after district administrators found some savings and factored savings from not hiring a firm to assist in strategic planning. How much that reduction should be, though, was something of a dispute during Monday night’s Board of Education meeting at Pocopson Elementary School — as an initial proposal to drop the weighted increase from 2.88% to 2.47% was amended to a revised proposal to increase taxes to by a 2.77% weighted average, with an eye toward preserving reserve balances. The proposed changes emerged Monday as new budget data emerged, officials said. “We found out that there was a realization of savings across the board,” Superintendent John Sanville said, citing a series of factors from interest income to slight boosts in state funding that were not known about until the last few days. 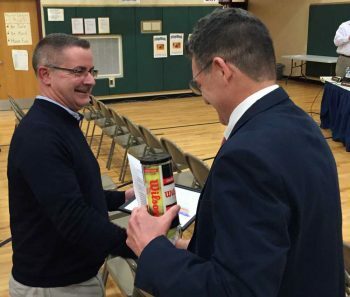 The point of dispute: whether or not to take some $193,000 from the district’s pension reserve fund. The original 2.88% budget proposal called for that amount to be taken from the fund, but the additional savings/additional state funding discovered in the last week would have allowed a tax increase of 2.47% weighted, just slightly above the state’s Act I index. The 2.77% would take little more than $5,000 from the budget reserve, a tiny fraction of the $82.4 million budget. Director Gregg Lindner expressed concerns about the current level of unassigned reserves — slated to be at about 3.8%, well below district policy to keep such reserves between 5% and 8%. However, it was pointed out the roughly additional $2.5 million in the pension reserve fund puts the district well within that guideline. He countered by arguing that any funds put into reserve now will ultimately go into the 10-year building plan and ultimately save money in the long term by reducing the amount of money needed to be borrowed — and argued that in future years, because of the compounding impact of Act I rates, it could be difficult to pay the debt service for the 10 year plan. “With Act I, you really have to think about the future,” Lindner said. Hellrung countered that he had concerns about holding the taxpayers money for future use and further noted that the district has routinely run at a surplus — estimated to be about $500,000 for the current budget year and would more than likely end up bringing in more money than estimated and spending less, again, for the 2016-17 budget year. A third option to keep the increase at 2.88% and add about $61,000 to the reserve fund didn’t get any discussion. Board president Victor Dupuis seemed to speak for many of his colleagues in thinking it best to err on the side of being careful and preserving financial options — and continue to maintain the reserves as long as possible. Hellrung, Carolyn Daniels and Robert Sage voted no on the 2.77% proposal, with the rest of the board opting for the higher rate. The revised proposed final budget would have a millage rate of 23.55 in Delaware County and an effective tax increase of 3.06% and a millage rate of 27.72 in Chester county with an increase of 2.70%. The final budget vote will take place on June 20. The ability to hang onto additional reserves and lower the tax increase was attractive to a number of board directors — a number of whom expressed concern about the impact of the out years, the looming end of Act 1 exceptions for pension costs as well as the district’s ability to maintain enough reserve to satisfy bond underwriters, not to mention newly tight budgeting procedures put into place for 2016-17 budget year, likely to reduce the typical yearly surplus seen in recent budgets. In other district news, two students, Matthew Daniels and Alice Liu, offered an update on their efforts to foster county-wide discussions on potentially changing the times of Chester County school days for high school students — citing growing scientific research showing that teens need more sleep and their natural sleep patterns do not match well with the current 7:30 a.m. to 2:15 school day. Daniels cited schools in Fairfax County, Va. which are now using an 8:10 a.m. to 2:55 p.m. schedule, offering about 30 minutes of extra sleep the high school students without compromising afternoon activities as a possible future direction for county schools. Daniels and Liu have been with with other students from around the county in an effort being facilitated by the Chester County Intermediate Unit — as because of sports and other inter-school activities, it would be almost impossible for one school district to unilaterally change high school start times. Another county-wide meeting will be held on the subject at the CCIU o May 25. The board and Pocopson Elementary School Prinicipal Clif Beaver offered congratulations to gifted teacher Dennis Nelms, who is retiring at the end of the school year. Nelms — one of the last teachers remaining in the district who was hired by then Unionville Middle School Prinicipal Charles F. Patton in 1981, has taught at every school in the district — except Unionville High School. Lastly, Dupuis expressed his frustration at the response to a letter signed by 11 or the 12 superintendents of Chester County school districts, including Sanville, asking the state legislature to do a better job of completing the budget in a timely fashion, so as not to leave schools wondering about state funding. Dupuis said only one legislator responded — State Rep. Tim Hennessey (R-26). While the district did not release the letter, Dupuis termed it as dismissive, suggesting that superintendents and school districts should not attempt to politicize the budget process. While much of the angst on the budget issue was aimed at Republicans, who control both chambers of the legislature, Sage noted that the issue was bipartisan, and that Gov. Tom Wolf deserves half of the blame.